After 13 years of car camping, we’ve pretty much nailed down our daily routine. It’s almost always the same. Wake up, eat breakfast, go for a hike, eat lunch, enjoy some beach time, eat dinner, sit around the campfire, go to bed. Of course, in between those things there are camp chores that need to be done, games of UNO to be played, etc. I like going on a hike in the morning and spending the afternoon in R&R mode because (a) then I feel like we’ve accomplished something and that (b) we truly EARNED some lazy time and (c) it breaks up the day. What also hasn’t changed in 13 years is our approach to food. It’d be fair to assume this kale and quinoa lovin’ mamma upholds the same values when it comes to planning camp meals, but nothing could be further than the truth. To summarize: we pig out on junk. It’s pretty much the only time of year I buy sugary cereals, granola bars, hot dogs, and those little packages of crackers and spreadable cheese. Here’s a sample menu I tapped out a few years ago. Every year’s menu is essentially the same. This year I decided to make a small change, which is easier said than done. You see, I wanted to replace our traditional camp pizzas for something that didn’t need someone to light a fire or make use of the camp stove. It also had to be something that is easily prepared AND a meal that everyone likes. 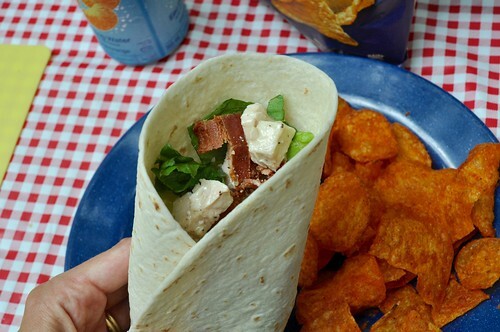 And so, after some reflection, I decided it this new entry into our camp menu should be a Chicken Caesar Wrap. Depending on what kind of person you are, there are a few different ways you can prepare a wrap of this kind, However, in my option, this is one of the best things about this recipe. It can be as easy or as fancy as you want it to be. Chill chicken breasts in a marinade before leaving home. Grill prepared meat over a smoky open fire at the campsite. As soon as they’re cooked through, dice and toss with homemade caesar dressing, top with romaine, freshly grated parmesan cheese, fried pancetta, and wrap in flour tortillas. (Bonus points if you’ve made them yourself.) By the way, here is an EXCELLENT recipe for a grilled caesar salad. While in frantic pre-camping prep stage at home, poach a couple of chicken breasts and store them in a plastic container. Pack in cooler. Once on site, dice chicken and toss in store bought caesar salad dressing from one of those salad kits. Divide coated chicken mixture among flour tortillas. Top with the remaining parts of the salad kit (romaine, questionable parmesan cheese, croutons) and crumbled leftover bacon from breakfast. Roll and serve. Although I admire Method A types with all of my heart, when we’re camping we are all about METHOD B, so this is how we made our wraps. And you know what? They tasted great. Share the post "Camping 2016: part two and a chicken caesar wrap (made two ways)"
No Responses to "Camping 2016: part two and a chicken caesar wrap (made two ways)"